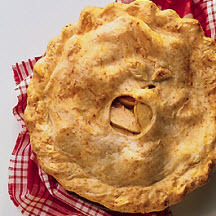 There's an old New England saying, "An apple pie without the cheese is like a kiss without the squeeze". Serving apple pie with cheese is a common practice in parts of New England and the Midwest. The sweet-savory combination of tart and sugary apples and a buttery crust with sharp, slightly salty cheese is wonderful. For Crust: Sift together the flour and salt. Stir in the cheese until thoroughly mixed. Dice the butter, and work it into the flour until the texture resembles cornmeal. Sprinkle in the water, one tablespoon at a time, mixing until all of the flour is moistened and the dough pulls away from the sides of the bowl. Divide the dough in half. Shape into two flattened rounds. Roll on a lightly floured surface until the dough is 2 inches larger than an inverted pie pan. Line a 9-inch pan with one crust, reserving the other for the top. For Filling: Place the apples in a large bowl. Combine the sugar, cornstarch, cinnamon, nutmeg, and salt in a small bowl. Gently stir the sugar mixture into the apples until the apples are well-coated. Place the apples in layers in the pastry-lined pan. Dot with butter. Cover with the upper crust and cut slits so steam can escape. Bake in a preheated oven at for 10 minutes. Reduce temperature to 350°F (175°C) and bake an additional 35 to 40 minutes.